The federal government has agreed to add a new element to Canada’s proposed free-trade agreement with Colombia, an amendment negotiated by a Liberal MP. Acting on his own, International Trade critic Scott Brison approached Colombian leaders earlier this year with the idea of strengthening the human rights provisions of the controversial trade deal. Brison said he presented his proposal to Colombian President Alvaro Uribe in January at the World Economic Forum in Davos, Switzerland. "He expressed interest and support, broadly, for the proposal," Brison said, adding the president wanted to help quell concerns about the human-rights situation in Colombia. Many Canadian unions, church organizations and human-rights groups oppose the trade agreement. Canadian companies shouldn’t be doing business in a country with high levels of violence towards trade unionists, indigenous leaders and others, they say. Brison’s idea was for both countries to conduct annual human-rights assessments to measure the impact of the free-trade deal. After getting the tentative go-ahead from Uribe, Brison said, he contacted an old acquaintance, Colombian Trade Minister Luis Plata, as well as Colombia’s foreign minister, Liberal MP Bob Rae and staff at Canada’s Department of Foreign Affairs and International Trade. Together, Brison said, they worked out the wording of a formal amendment to the free-trade deal. In the end, all that was left to secure was support from the Canadian government, which occurred late Wednesday afternoon during debate in the House of Commons. "In the spirit of not being afraid to advance human-rights interests we would certainly be amenable to an amendment to the type suggested by the honourable member," International Trade Minister Peter Van Loan said. "It will be the first FTA in the world to require an annual human-rights assessment to be tabled in both countries’ parliaments," he said. 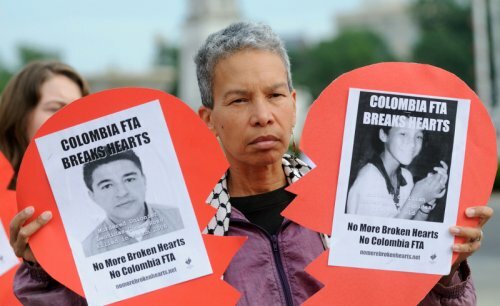 "In Canada that will give us the capacity to debate at the trade committee, to be able to call witnesses both from Colombia and Canadian organizations and groups." Brison said the amendment will "ensure that on an ongoing basis, we never let the issue of human-rights engagement disappear." Canada and Colombia signed off on the trade agreement in the fall of 2008. It has been making its way through Parliament ever since, with a final vote expected this spring. Both the Bloc Québécois and New Democrats oppose the deal. "The problem all along has been the Colombian government’s complete lack of ability to deal with these major human-rights violations with its connected paramilitaries and its own military arm," NDP trade critic Peter Julian said in dismissing Brison’s amendment. But Brison was equally dismissive of the NDP’s point of view: "The NDP are fundamentally and philosophically and ideologically opposed to free trade. They should just say that and stop using human rights as an excuse here." Brison added that while he feels this Parliament has not been particularly constructive, this was an example of MPs working together across party lines.